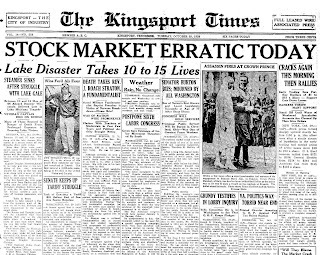 After Monday’s historic stock market plunge, I wondered how today’s headline writers would compare. 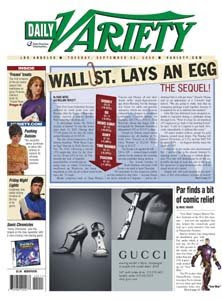 Did anyone come up with such a memorable headline? To find out I went to the website of the Newseum, the silly-named journalism museum in Washington D.C.
Every day the website (newseum.org) posts the front pages of 628 newspapers from 57 countries. No. But maybe that’s asking too much. That really was a once in a lifetime headline. 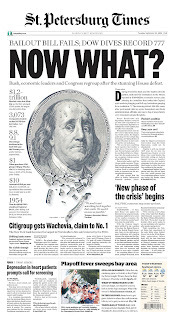 The most popular headline was: “Now What?” or its variation “What Now?” Among those using “Now What?” in Tuesday’s newspapers were the San Francisco Chronicle, Bakersfield Californian, Aurora (Colorado) Sentinel, Miami Herald and St. Petersburg Times, which gets extra points for an illustration of Ben Franklin sweating. The Stamford Advocate, Indianapolis Star, Rocky Mountain News and Denver Post all went with “What Now?” That’s particularly interesting since the Rocky and the Post are competing newspapers in Denver. Still there was a lot of creativity out there. Of course. They can’t beat their old headline either. I’ve been a fan of great headlines since I was a freshman in college and papered my dorm room wall with them. 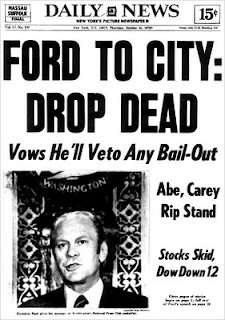 “Ford to City: Drop Dead” – in the New York Daily News after President Gerald Ford nixed a bail out for financially troubled New York City in 1975. The unintentionally funny “Rod Stewart Songs To Become Musical” from Edinburgh’s The Scotsman after the announcement that a producer was considering a musical revue based on Stewart’s hits. 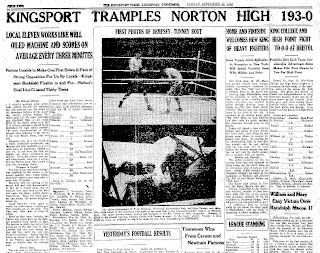 It’s the most famous score in D-B sports lore: 193-0, the final score of Dobyns-Bennett’s 1926 win over the Norton football team. How did D-B do it, score a touchdown every 60 seconds? I’ve wondered about that for years, literally. The first time I remember hearing about the score was in 1964 in driving class from Coach Cecil Puckett, who wasn’t even born when the game was played. But he knew about it. I’ve read the game stories from the old newspapers. And anytime I met someone who was a student at D-B back in that era I would ask. The late Holiday Smith, who was a sophomore that year, told me he didn’t go to that game. The late Lawson Reams, who was a D-B cheerleader in the mid-twenties, told me about a 1925 game against Tennessee High that D-B won 100-0. He said the cheerleaders were rooting for Kingsport to miss the last extra point so the final score would be an even hundred. They did. But he didn’t know any details from the Norton game. Finally I have a first hand account from a Norton player. And it comes from Arthur “Pedie” Poston of Wise. Pedie wasn’t the player. But he interviewed the player. Pedie says when he asked Harman about the game, “He threw back his head and laughed. Norton’s football program was in its second year and Pedie says Harman told him that Dobyns Bennett had a very good team. In the first paragraph I wondered how D-B could score a touchdown every 60 seconds? After reading the game story, I know the answer to that question. They couldn’t. but they did score a touchdown every three minutes. High schools apparently played longer games in the twenties. According to the box score the quarters in that game ran fifteen minutes (first quarter), twelve minutes (second quarter), fifteen minutes (third quarter) and twelve minutes (fourth quarter). D-B’s leading scorer wasn’t its most famous player, Bobby Dodd. 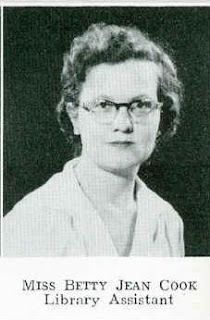 Dodd, who played quarterback, scored five touchdowns. Left halfback Paul Hug scored eight times. Right halfback Fred “Gabby” Merideth had two touchdowns and fullback Jimmy Duncan had three scores. Reserve running back Speedy Clyce tallied four touchdowns. Six other players also scored. If the name Poston looks familiar, it should. Pedie’s dad Art was a brother to Jim Poston, who owned Poston’s Grocery at the Upper Circle. , Pedie’s uncle Bill Poston owned the Yellow Front Fruit Market and his uncle Howard Poston was an attorney and Sullivan County judge. 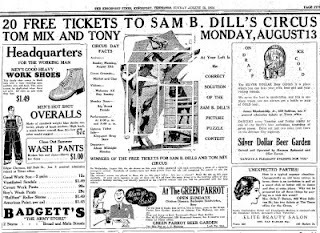 Ben Sullivan and I have been joking for the past few years about Tom Mix’s Duesenberg. Tom Mix was the old western movie star, probably the most famous cowboy star of the twenties. And Ben has told me for years about how Tom came to Kingsport with the circus when Ben was a little boy. Tom didn’t ride in on his famous horse Tony. He drove into town in a Duesenberg while Tony came on the circus train. And I’ve been telling Ben that was probably the first time a Duesenberg came to Kingsport. And also probably the last. And we both laugh. I saw Dave Berry at the Mason-Dixon reunion Saturday and I knew I could test my theory. No one in Kingsport knows more about old cars than Dave. So I asked Dave: Could that have been the first time a Duesenberg came to town? And was it the last. First a few words about the Duesenberg. It was manufactured in Auburn, Indiana from 1913 to 1937 and is generally regarded as the finest car ever manufactured in this country. Each auto – and there were only about 1,200 built over that 25-year period – was handmade. So they weren’t cheap. They cost a king’s ransom. Which explains why the King of Spain, Alfonso XIII owned one. Also King Carol II of Romania and the Duke of Windsor, the man who would be king. In Hollywood Gary Cooper had one; also Clark Gable (when Gable saw Cooper’s he knew he had to have one), Howard Hughes, Marion Davies, William Randolph Hearst, Greta Garbo, Buster Keaton, Mary Pickford, Gloria Swanson, Rudolph Valentino. And Tom Mix. That was the car that Mix drove into town in on August 12, 1934, a 1932 Duesenberg J-462 Custom Speedster. Two days later he drove out of town, heading to Johnson City for the circus’s next date. And, I joked, that was the last Kingsport saw of a Duesenberg. Dave Berry says a car collector from the Northeast brought a Duesenberg to Kingsport for a national car show ten years ago. And thus Kingsport missed out on an opportunity for a home-owned Duesenberg. We may never get that chance again. Duesenbergs, of which about 600 are thought to still exist, are much prized on the classic car auction circuit. Tom Mix’s 1932 Duesenberg Speedster was sold at auction in 2003 for $530,000. Edsel Ford’s 1931 Speedster went for $1.76 million six months ago. A year earlier the last Duesenberg ever manufactured, a 1937/1940 Model SJ Cabriolet sold at auction for $2.55 million. 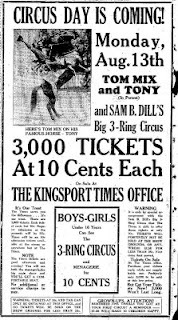 As for Tom Mix, he made only one more cowboy picture after his circus show in Kingsport. He died in a car accident in the Arizona desert three years after visiting Kingsport. He was speeding down a road and ran into a construction detour. The old cowboy was driving a 1937 Cord 812 convertible, widely known as a Baby Duesenberg. 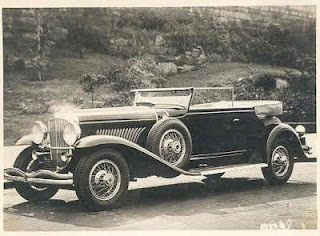 Tom Mix drove a Duesenberg similar to this 1932 Speedster into Kingsport on August 12, 1934. The reunion was Saturday September 13 at the Eagles Club. Pictured above are Bob Banks, who came the farthest (Florida) and Charlie Goode, who worked at the trucking company the longest (43 years). Betty Cook retired from D-B on Thursday, Sept. 11, 2008, after working at the school for 56 years, as both a secretary and as a librarian. That has to be a record. 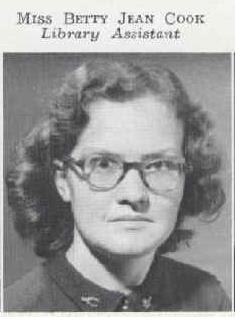 That's Betty from the 1953 annual above, then the 1956 yearbook and a photo I took Wednesday at bottom.